Baby Bunnies! In Mini Cupcake Form. Enough Said! Baby bunnies! OMG sooooo fluffffy! 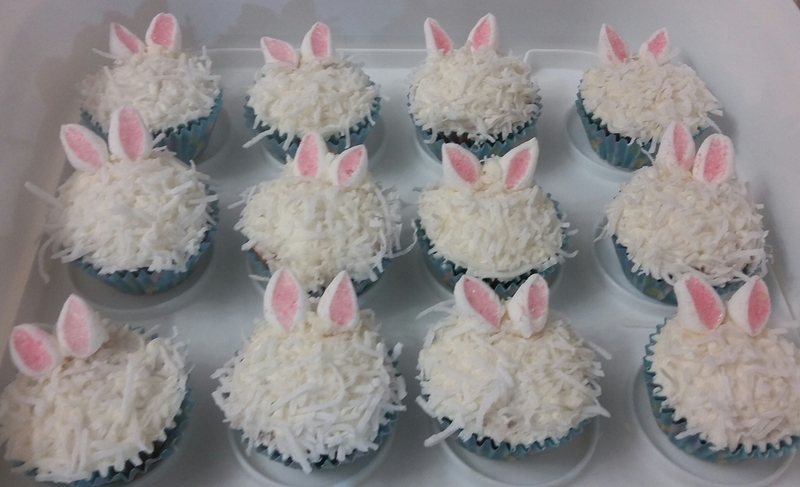 I’ve been seeing a lot of bunny type cupcakes on some of the cupcake and cake FB groups that I belong to, and I decided I’d like to make up my own version of them. So yesterday I whipped up 40 of these babies to send to work with the DH this morning. The recipe is a modification of one that a number of cupcake bakers use, at least according to the afore-mentioned FB groups, but I wouldn’t be me if I didn’t change up a whole bunch of things, just because. Like the lack of eggs. And the presence of ground flax seed. But there’s a connection! I was planning on making these cupcakes for a while, but last night at the 11th hour (technically at the 10th hour, as it was 10 pm), I realized I was out of eggs. However, I have a huuuuge amount of flax seeds just sitting in my fridge (I bought an even huuuuuuger amount from a bakery outlet a while back), so…a flax seed egg it was, or rather two flax seed eggs! One makes a flax seed egg by mixing a tbsp. of ground flax with 3 tbsp. of water and letting it sit for 10 minutes until the mixture gets all gummy and gooey and takes on a raw egg white texture. It’s basically working as a binder, and it will definitely make your ingredients stick together. But enough with the chitter-chatter, on to the recipe! Mix everything together until just mixed. It should a very un-thick batter, which is good. And fyi, the combo of baking soda and baking powder is what makes them so light and fluffy. Fill the cups of the mini cupcake tray halfway and bake at 350 degrees until golden on top, about 10 minutes. Ice and cover in flaked coconut. Try not to eat them all. Once the mini cupcakes are cooked, ice them thinly with the buttercream icing, using a knife. I talk about buttercream icing more here, but a really nice basic one is just a mixture of equal amounts of butter and shortening, with a dash of vanilla extract, a splash of milk, and a whole bunch of icing sugar, whipped for a long period of time until fluffy. 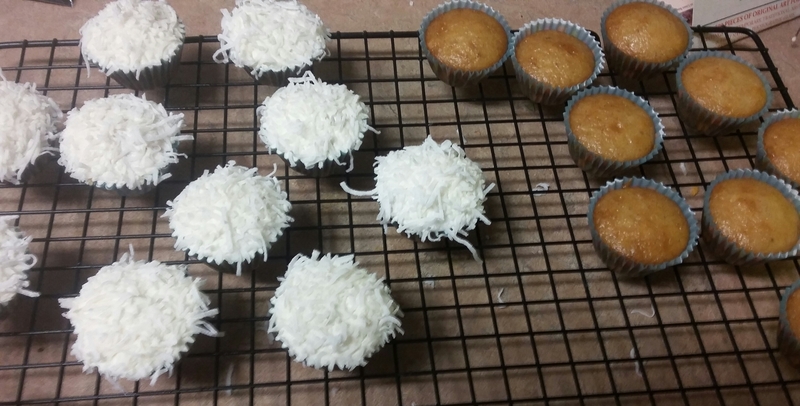 So, ice the cupcakes, then dunk them upside down into a bowl of the shredded coconut. Using a dab of buttercream frosting, press two bunny ears into the top of the cupcake. And voila, done! Want to know how to make those bunny ears? Couldn’t be easier! Take a mini marshmallow, and cut it in half diagonally using a pair of scissors. Dip the sticky middles of those two cut pieces into a bowl of the sanding sugar. 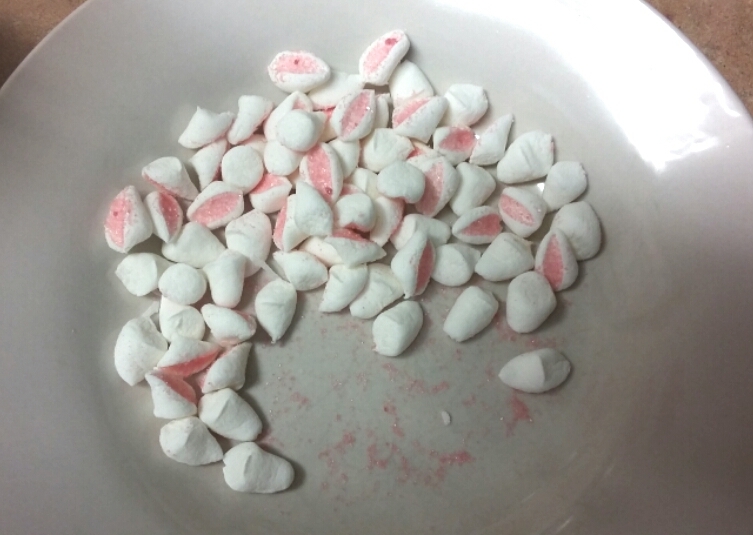 The sugar will stick only to the inside of the marshmallow, resulting in a pink inner ear. Aren’t they adorable? Too cute! A bowlful of bunny ears! Squeeee! The finished product is too cute as well! The DH took them to work this morning, and apparently everyone loved them! If you like coconut, you could even use coconut oil in place of the shortening in the buttercream, and it would be a coconut buttercream. I’ve done that before and it’s also delish! And just think — between the coconut oil and the flax seed, why these are practically healthy, right? At the very least, the health benefits of the healthy oils balance out the sugar, wouldn’t you say? These cupcakes would make great bonbons to place at place-settings at Easter dinner, or to make with kids as an Easter weekend crafternoon. If you make some, let me know — I’d love to see pics! I mean, cupcakes and bunnies — what could be cuter? 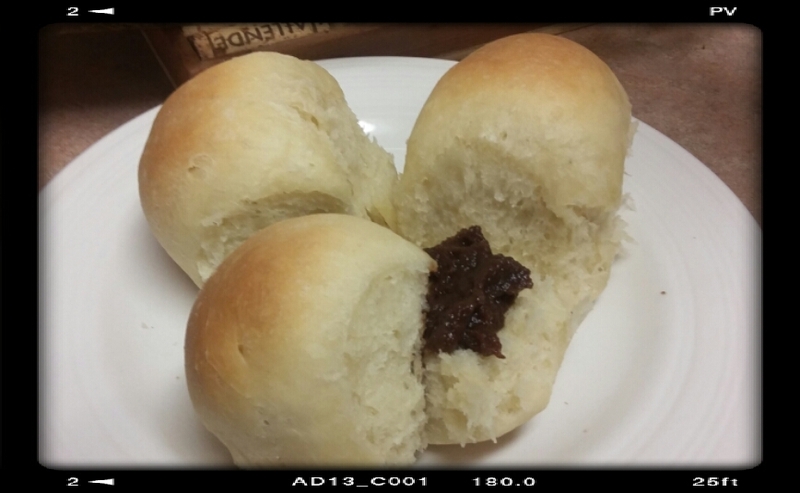 Next Post: More Dinner Roll Odyssey? Or the Parmesan and Paprika Potato Wedges that I made recently? We shall see! This entry was posted in Cakes, Desserts Not Otherwise Categorized on March 25, 2016 by Margaret. 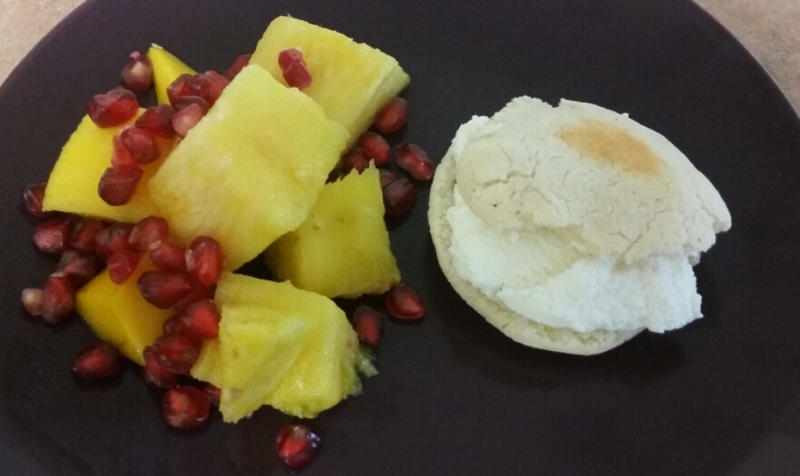 Served with lemon curd because it looks prettier. Also tastes pretty good, in case you were wondering. I was talking with a friend of mine tonight, Ken, an artist who is currently living in…somewhere in South East Asia. I lose track of his travels. I actually had to say to him, “Remind me, which country are you in right now?” (It’s Cambodia, btw.) Anyway, as I’m chatting away with him on Facebook, I’m also popping in trays of delicious French financiers into the oven, and pulling out (and sampling!) more trays of these golden-domed treats. What are these delicious, buttery things I write of? Well, the origins of financiers are a bit murky. Some say that they are called financiers because of the financial types who used to eat them on their hurried coffee breaks; the buttery almond treat could be held in a hand and quickly gobbled in between weighty financial transactions. Others say that the financier is named such because when baked in the traditional shape, they resemble gold bullion bars. How did I find this out? Two words! Well, three, actually. Dorie Greenspan. And Wikipedia! 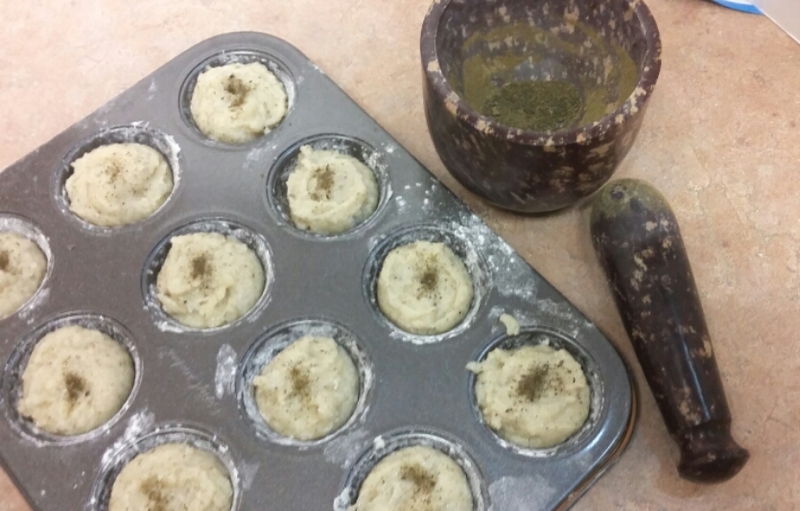 My baking group is baking Matcha Financiers from Dorie’s Baking Chez Moi cookbook this week, and she talks about the origins of the treat in her recipe intro. And then I wikipedia’d it too, because that’s how I roll. 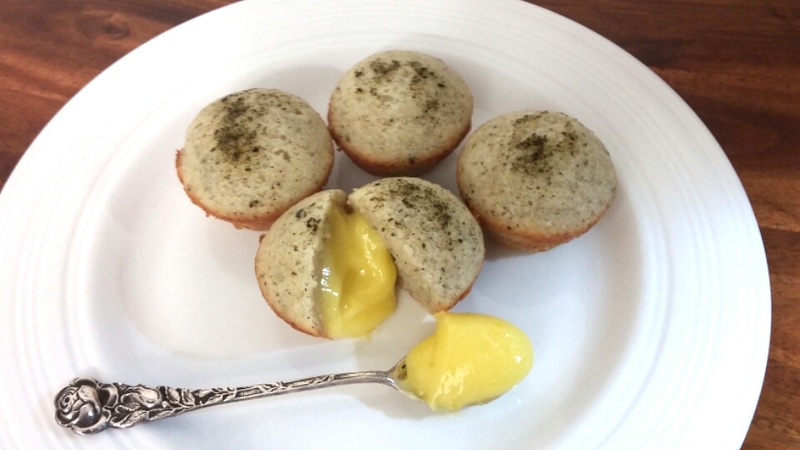 Dorie takes the traditional financier recipe and gives it a bit of an Eastern twist, with the introduction of Matcha powder. 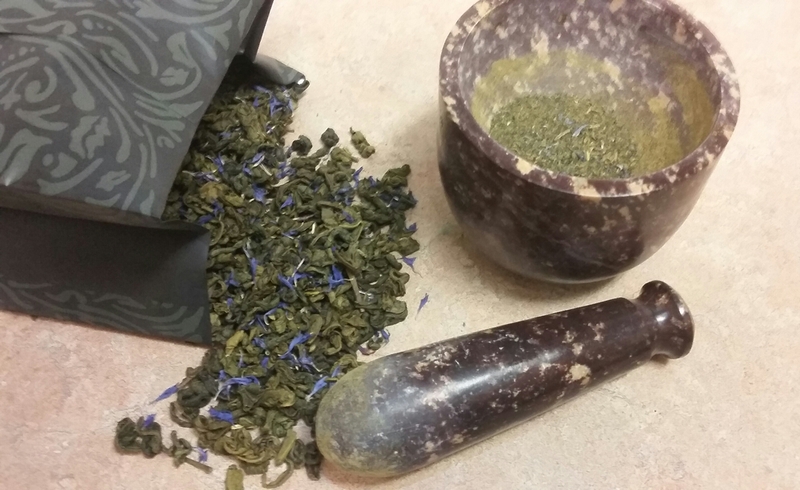 I, of course, having no matcha powder or the inclination to go shopping for any, replaced the Matcha tea in the recipe with ground Earl Grey Green tea, of which I had plenty. Hey, it’s green! Close enough? Eh, it’ll do. The recipe calls for only egg whites to be used, which makes the financiers all crisp and light, despite the heaviness of the almond flour that is also used. The way I look at it, the low-fat egg whites balance out the caloric effect of the butter that is added into the batter mixture. What do I think of the financiers? Well, given that I’ve never had them before, it’s hard to know why they don’t knock my socks off. Is it the addition of the Earl Grey Green powder instead of the Matcha powder? Or is it just that the flavour isn’t what I was expecting? Maybe both. I think if the butter had been browned the way that it often is, I might like it more. Or if the tea flavour was either stronger, or not present at all. The faint bergamot flavour of the Earl Grey Green tea is nice and all, but…it’s just too vague. I like my treats with some oomph! And/or chocolate. I’m typing this post while sitting on my couch with my laptop, as I often do, taking a break from my kitchen-chicken ways. Hanging on the wall across from me is a framed print of one of Ken’s watercolours. I have to say, having real art on my walls makes me feel so grown-up! (Because mere age isn’t enough to do that on it’s own, obvs.) Using tea in my baking also makes me feel grown-up. Next time, though, I think I’ll use one of Dorie’s Bonne Idees, and add in chopped chocolate to the batter. Chocolate Everything may not be a terribly grown-up flavour profile, but it is one that I’ll happily nom on. Don’t worry, Chocolate, you’ll always be my favourite! This entry was posted in Cook-a-Longs R Us on March 22, 2016 by Margaret. 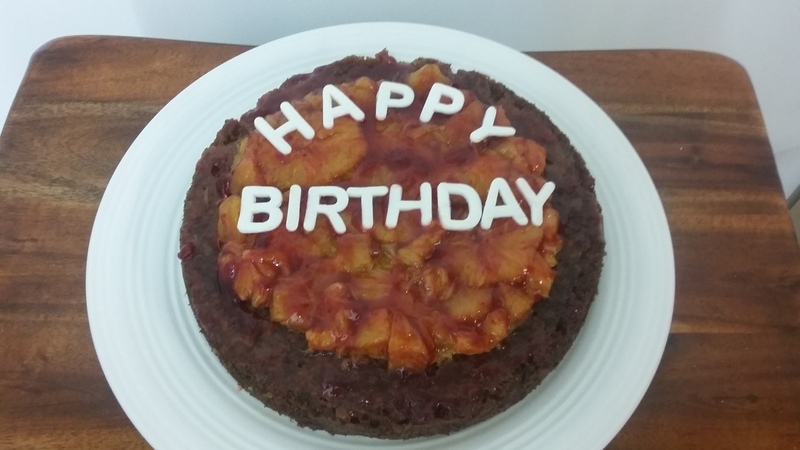 Odile’s Orange Cake, Birthday Surprises, and Butter-Related Incidents: Must be a BCM Post! Happy Birthday, Babycakes! Eat, drink, and be merry! Also, please cut me a slice. Hey, guess what I did last weekend? 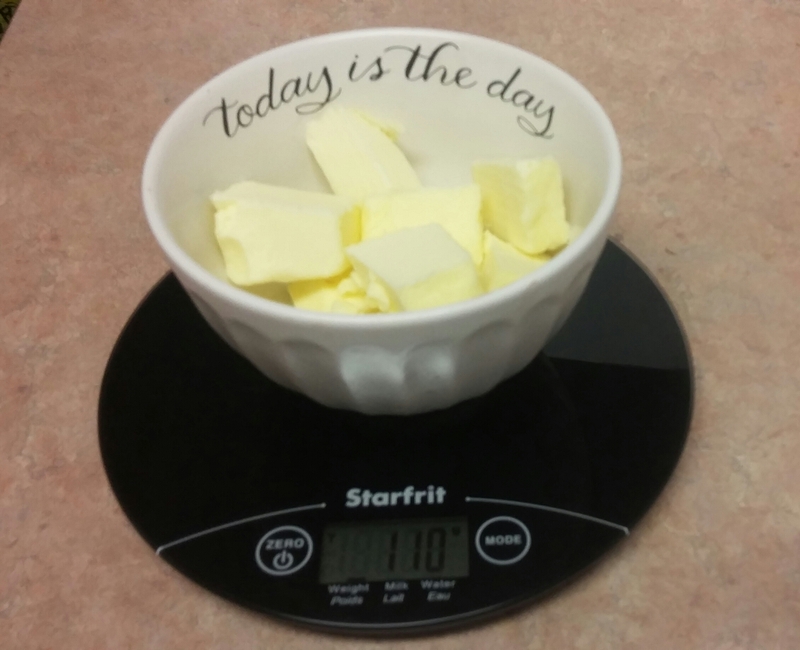 I bought a kitchen scale! Not terribly earth-shattering I know, but I’ve been having too many butter-related incidents with my baking recently (this one, for example), so I thought it was time to invest in one (read “spend $20 at Walmart”). I used my scale for the first time today, when I was making this week’s recipe for my bake-a-long group: Odile’s Orange Cake from Dorie Greenspan’s Baking Chez Moi cookbook. This is basically a simple one layer sponge cake, with flecks of orange zest in it. Once out of the oven, it’s brushed with a simple syrup made of sugar, water, cinnamon, and orange slices. Finally, one arranges the poached orange slices on top, and finishes the whole thing off with a glaze of orange marmalade! At least, that’s what the recipe says. What did I do? Well, remember I call myself the Queen of Substitutions! Also, I had no orange marmalade. I also had no inclination to buy a jar of orange marmalade in order to use maybe two tbsp. glazing this cake. So I used the jam that I did have in the fridge…triple fruit strawberry jam! Same thing, right? Eh, it works as a glaze. So it gives the cake a bit of a ruby colour — that’s a good thing, right? Dorie does say that one can use blood oranges to top the cake with, so really, I’m just using her colour scheme, albeit slightly differently than intended. And…just to top things off, literally, it’s the DH’s birthday tomorrow (technically today, since it’s past midnight as I type this), so I cut out some letters from fondant and stuck them on top. Two birds, one stone, bam! I shall do a super-duper fancy-pants cake for this coming weekend, when we’re celebrating with family, but I thought two cakes in a week was enough so this cake is now his birthday cake. You’re welcome, honey! Is the scale worth it? Well, the proof shall be in the pudding, er…cake! I haven’t actually tasted it myself, because I’m waiting for the DH to wake up and cut a slice. (What’s that? Cake for breakfast? Don’t mind if I do!) But as soon as he cuts a slice, I’ll update you all with his reaction! Want to see how everyone else in the bake-a-long group made their cakes? Check them out here! Truly a great group of bakers. Edited to say: The cake! It was a hit! It was eaten with great gusto, and I’m saving one of the last slices to eat after my evening workout. Workout + cake slice = null calories, right? Mmm…cake! Next Post: I’ve been busily writing up draft posts and then not getting around to posting them, so I’ve got a backlog. 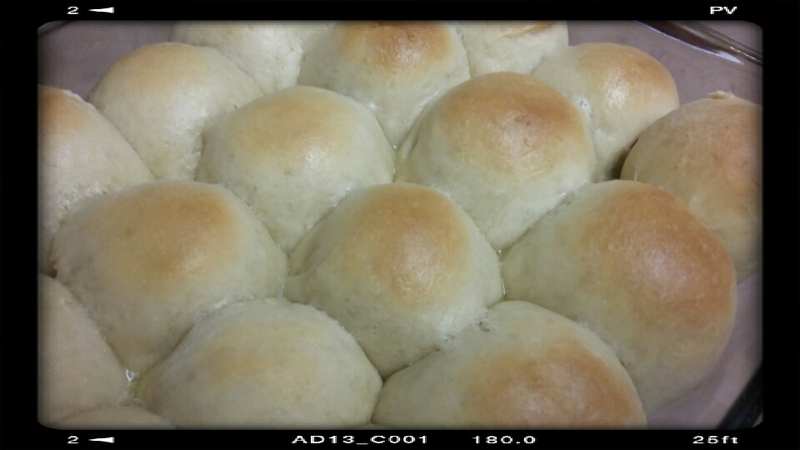 First up, the Dinner Roll Odyssey I’ve been promising. The result will be worth the wait! This entry was posted in Cook-a-Longs R Us on March 8, 2016 by Margaret.